The 7th Space Weather Week will take place at Congress Centre Oud Sint-Jan in Bruges, Belgium from November 15 to 19 2010. The purpose is to bring the various countries and institutions of Europe together on space weather issues that concern them all. It is organized by the European Space Agency, the Royal Observatory of Belgium, the Solar-Terrestrial Center of Excellence, and the European Commission COST office. This annual ESA workshop and related events builds on progress made the year before.This year, a tutorial on Monday, November 15 will discuss the effects of space weather on spacecraft and aircraft. 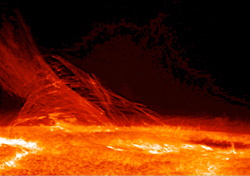 Presenter Keith Ryden says "…[with] our growing reliance on satellites for critical services such as navigation, the question is what scale of space weather storm engineers should design for, bearing in mind that much larger storms have occurred in the past than those observed in the space era to date. Also what effect would such a storm have on the aviation industry given the large number of people who are in the skies at any one time?" Last year, a session was devoted to Galileo and other GNSS satellites, whose medium earth orbit passes through the most severe parts of the outer radiation belt where the electron population is highly sensitive to space weather activity. For information, contact Alex Glover at the email address below.